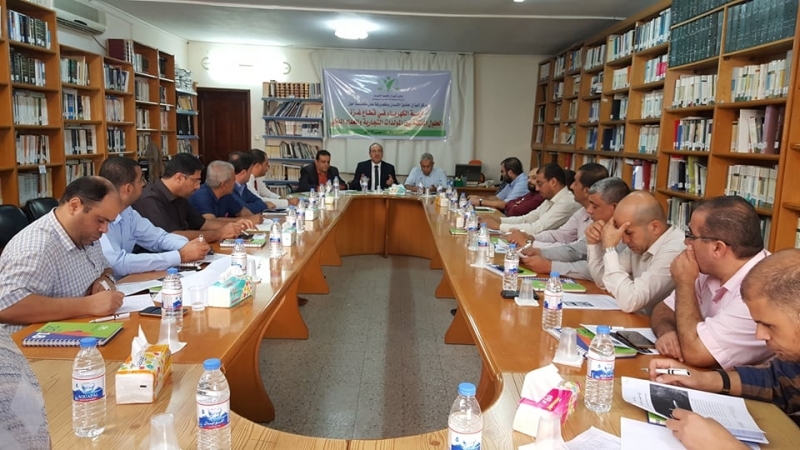 Gaza City, 22 October 2018 — Al Mezan Center for Human Rights has held an expert discussion titled “Electricity Crisis in Gaza: Potential Solutions from Generators to Smart Meters”. The discussion was joined by 25 experts from governmental, nonprofit, and international organizations. The discussion was organized at the Al Mezan’s main office in Gaza City. Mr. Issam Younis, Al Mezan’s general director, welcomed the participants and shared updates on the situation of human rights in the occupied Palestinian territory. “The Gaza Strip continues to maintain its legal status as part of the Palestinian territory occupied by Israel,” Mr. Younis said. “The humanitarian suffering of Palestinians in the Gaza Strip, protracted through ongoing closure and violations, has grown worse since Israeli forces bombarded the power plant in 2006.” According to experts, he further added, the sum of spending on alternative energy since the beginning of the crisis up to this year has totalled around one million USD. “Alternative energy can always be a good solution, but the arising problems must be addressed, especially in absence of legal regulations,” he stressed. At the end of his inaugural remarks, Mr. Younis expressed hope that the discussion would be an opportunity to build practical proposals to develop current solutions and to explore potential others. -- The international community should exercise pressure on Israel to increase the supply of electricity provided to the Gaza Strip. As the occupying power, Israel is obligated by international law to ensure that Palestinians have access to standards of dignity of life—otherwise undermined by lack of electricity. -- A technical committee should be formed and should be tasked with monitoring the use of generators, developing regulations on their use, and liaising with municipal and security bodies to ensure compliance with these regulations. This technical committee should be comprised of a diversity of actors: the Palestinian Energy Authority, Electricity Distribution Company, the Palestinian Environment Quality Authority, the Palestinian Ministries of Local Government, of National Economy, of Health, of Labor, of Justice, and of Finance, the Palestinian Civil Defense, and Palestine Telecommunications Company (Paltel). The regulations to be set by the committee should clarify location criteria, operation conditions, and safety measures for using generators to avoid causing harm, whether in emissions or noise, to people. -- Efforts should be exerted to promote the use of smart meters and to gradually introduce it across all residential areas in the Gaza Strip, beginning from residential complexes, with the aim of having it installed in each household until the crisis is resolved. -- Efforts should be exerted to promote the use of solar energy as a safe and reliable alternative. These efforts should entail facilitating the accessibility to and usability and affordability of solar energy devices. This facilitation includes liaison with competent authorities to ensure residential councils approve the installation and use of solar cells, in proportion to a resident’s ownership status and in respect of other residents’ rights.